Enjoy a few evenings with paint and some wine? BE inspired by my month spent in Paris. Paint three separate paintings, some with collage imagery. We'll begin by learning how to create an Impressionist Landscape, "The Bridge at GIverny," by Claude Monet. Use tones and shades as you dab and twist your brushes of bright colors . 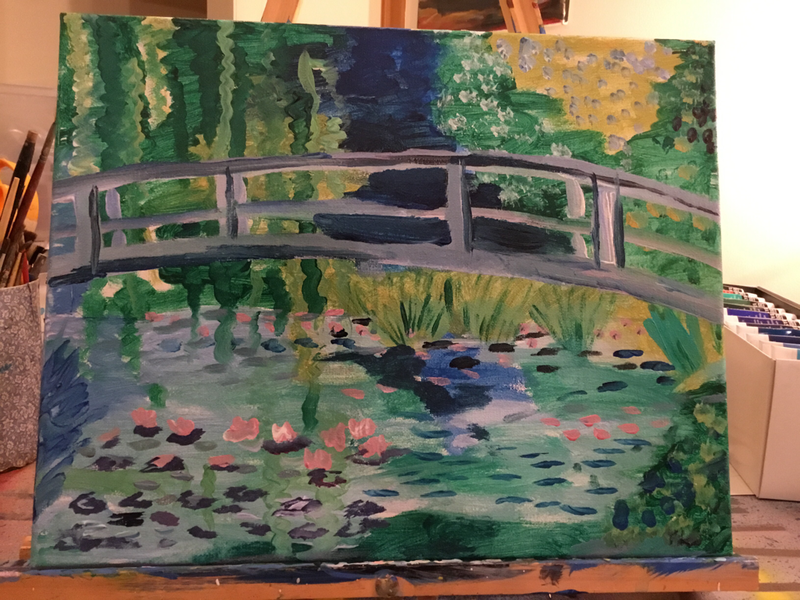 Inspired by Monet's Waterlilies at Musee L'Orangerie. Next, visit the fabulous Musee D'Orsay to complete a Ballerina Painting by Edgar Degas. Learn to paint and/or collage a ballerina onto a dramatic background. Week 3 will be a surprise. November, 14th, 21st and 28th.